I know summer is winding to an end, but that doesn’t mean I don’t want a good no-bake dessert. 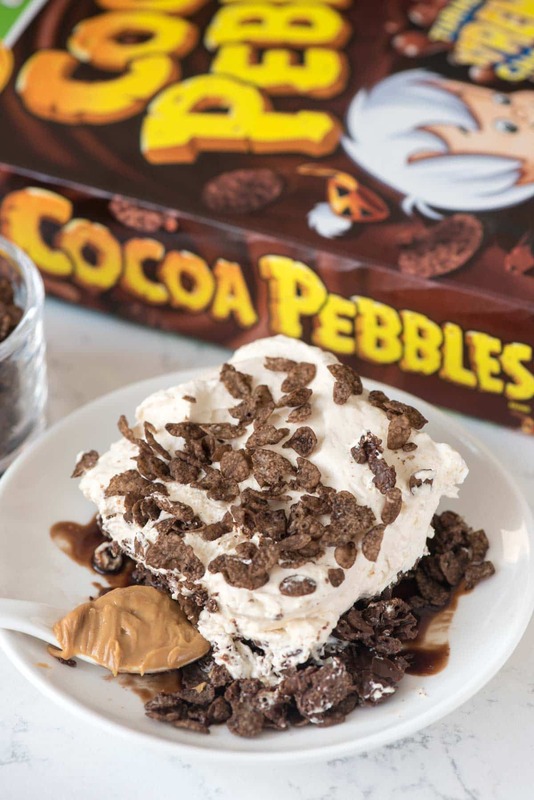 This Peanut Butter Cocoa Pebbles No-Bake Dessert not only satisfies my craving, but it makes me feel like a kid again too! I did something really fun and unexpected last week: had a mom sleepover. Mel was out of town and I let Jordan invite a friend to sleepover, but instead of just letting them do their thing while I binge-watched Nurse Jackie, I invited the mom to sleep over too. We’re friends and are always too busy to really spend quality time gabbing and catching up, so I figured I’d tap into my inner child and host an adult sleepover. It was probably one of the more fun evenings I’ve had in a really long time. We got to catch up, one on one, and act like kids again staying up late. Of course, the next morning we were paying for our late night. Just like the kids we were tired and just a bit cranky…except we had to adult. Sometimes acting like a kid again comes with a price, ha! Speaking of acting like a kid again, have you ever been at the grocery store and seen the brightly colored boxes of cereal and just NEEDED to buy them? I get like that sometimes; the craving for the cereals I love just MAKE me buy them. Fruity Pebbles and Cocoa Pebbles are two of the ones that call to me often. I love Fruity Pebbles dry – no milk. I’ll eat it as dessert with a spoon, savoring the fruity sweet crunch. Cocoa Pebbles MUST have milk because at the end you get a bowl of chocolate milk you can slurp like when you were 11 and annoying your mom at the breakfast table. But, if I’m being honest, one of my favorite things to do with those cereals is turn them into something else. 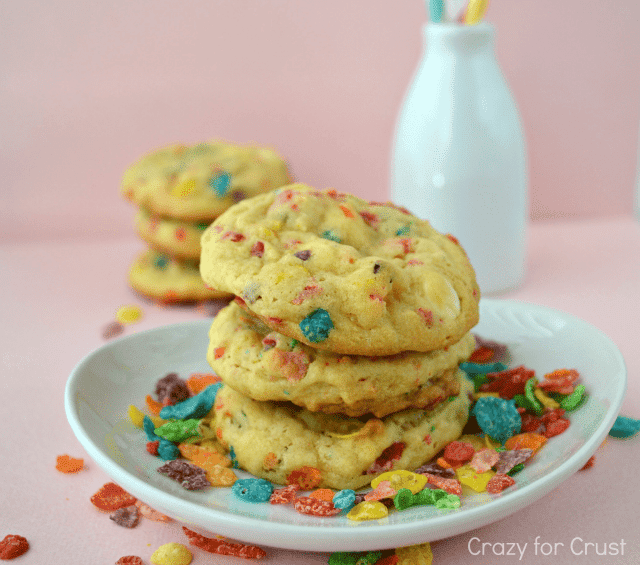 After all, one of my more popular recipes is my Fruity Pebbles Pudding Cookies. Have you tried them? Those are actually one of my favorite pudding cookie flavors. I followed them up with Fruity Pebbles Muffins, making Pebbles portable. I realized recently I have no recipes with Cocoa Pebbles. That’s just..wrong. I decided I needed to change that…so I made a No Bake Peanut Butter Cocoa Pebble Dessert. That was a GOOD DECISION, y’all. This dessert is completely no-bake, which I love year round. It’s full of peanut butter and chocolate, so it’s obviously one of my favorite things ever. Plus, ALL THE COCOA PEBBLES. The crust is made out of them. I took Cocoa Pebbles and mixed them with peanut butter and melted chocolate chips and then pressed them into a 9×9″ pan. Once it hardened it becomes a crunchy, sweet, chocolatey peanut buttery cereal crust! Then I made an easy no-bake peanut butter cheesecake to spread on top. It’s super soft and fluffy and surprisingly light, so it lets the crust totally stand out. Sprinkle some more Cocoa Pebbles on top and feel like a kid again eating DESSERT! Which Pebbles are your favorite? 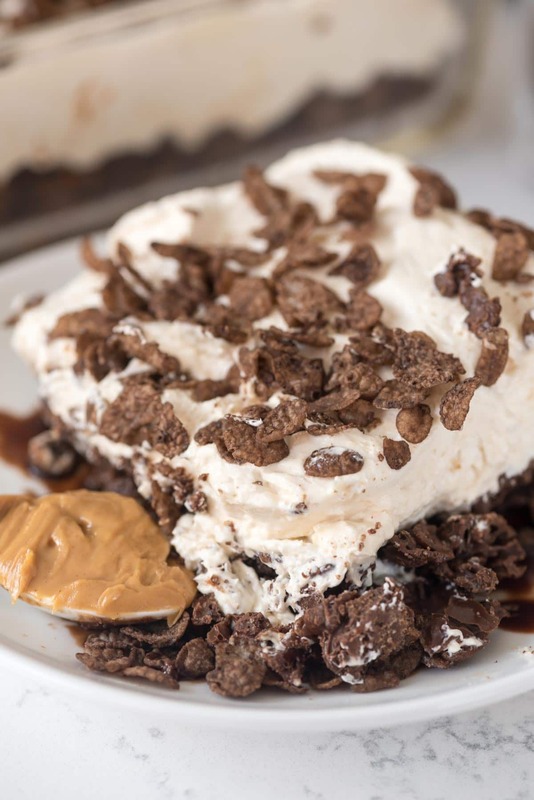 Peanut Butter Cocoa Pebbles No-Bake Dessert - make a crust with Cocoa Pebbles and peanut butter and fill it with no-bake peanut butter cheesecake! Feel like a kid again with this easy dessert. Place peanut butter and chocolate chips in a medium sized microwave safe bowl. Heat on high in 30 second increments, stirring between each, until melted and smooth (about 1 minute). Stir in cereal and stir to coat. Spray a 9x9” pan with nonstick cooking spray. Place the crust in the bottom of the pan and press it flat with a spatula. Chill while you make the filling. Beat cream cheese until smooth, then mix in the peanut butter until no lumps remain. Mix in sugar and vanilla and then fold in whipped topping. Spread cheesecake mixture over the crust. Chill to set, about 30 minutes (or longer), then sprinkle with more cereal for garnish. Cut and serve with chocolate sauce. For more inspiring Pebbles content, connect with us on Facebook, Instagram, and Twitter @PebblesCereal. This post has been sponsored by Post Cereals Cocoa Pebbles. All opinions are 100% my own. Wow, a mom sleepover? That is so cool. I never even thought of that! It should be a thing people do. Like, a movement. With grown-up frosty drinks! I also crave the sugary cereals of my youth, but I’ve never turned them into a no-bake dessert before. This is so great! Mmm this dessert was made for me! Cocoa Pebbles is one of my favorite cereals (next to Fruity Pebbles) and I STILL eat it as an adult! 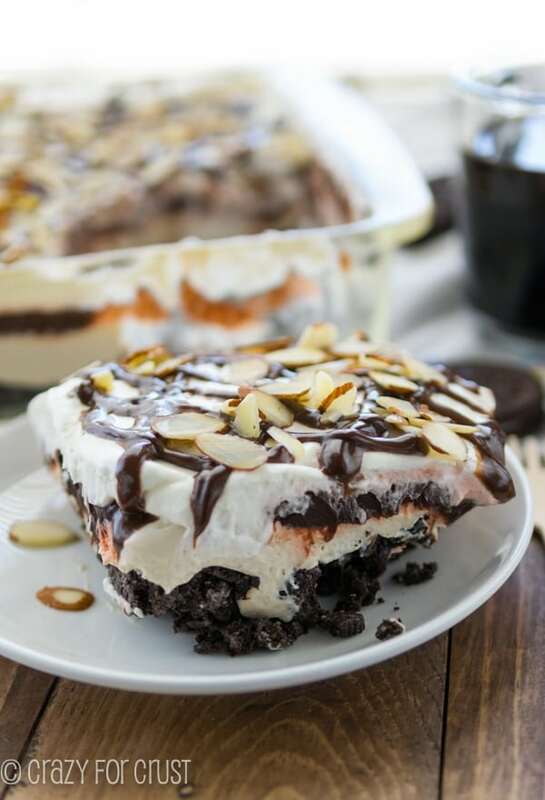 This no-bake dessert looks perfect to satisfy my sweet tooth! Every once in awhile the Reese’s puffs box will call out to me and I’ll fall prey to its siren song. It’s always worth it though. This looks fabulous and like it would work with any ultra-chocolately cereal! Also, I love having adult sleepovers, especially when there’s wine! Fruity Pebbles, Cocoa Pebbles, and Cap’n Crunch were my favorite cereals growing up. I always put Cocoa Pebbles in my monster cookies. This dessert makes the eight year old in me very happy! I haven’t had Cocoa Pebbles in years (and I’ve never had a mom sleepover along with the kid but that’s a great idea!) and this looks perfect! 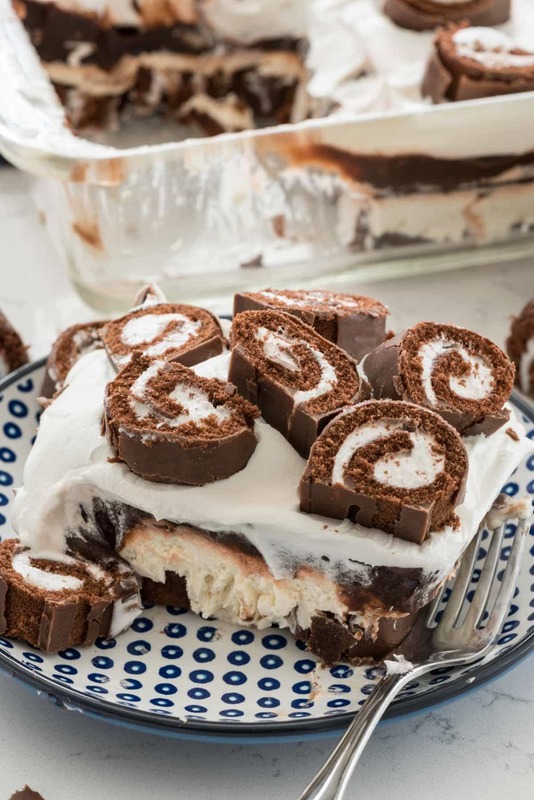 Love that it’s no bake, too! I love the idea of a mom sleepover! And man – I haven’t had Cocoa Pebbles since I was a kid. Awesome! It’s been so long since I’ve had Cocoa Pebbles! 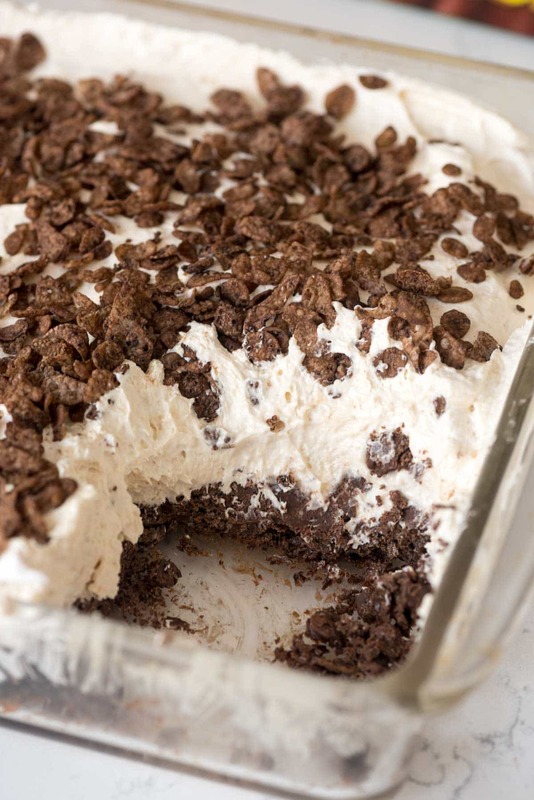 It was my favorite as a kid, so I can’t wait to make this no-bake treat!! I have mom sleepovers when they come up with their kids to visit from the Bay Area (and, of course, with my sisters) – love them! Most adults don’t do fun things they used to do when they were young. A mom sleepover, how fun!!! I’m feeling really deprived right now because I haven’t eaten either cereals. I know, right!! I was the kid who ate Cheerios and Raisin Bran. I’m so boring! I think I need to change that by making this!! Do you use semi sweet or milk chocolate chips? Cocoa pebbles is already basically the best cereal IN EXISTENCE and then you went and added pb and cream cheese to it. I LOVE YOU. You could extend your Cocoa Pebbles love to cookies! A friend gave me the recipe and it’s been my go to cookie ever since. It’s basically the same no bake recipe that uses cornflakes for a drop cookie – only subbing the Cocoa Pebbles for cornflakes. In large saucepan, mix sugar & corn syrup. Bring to boil. Drop on parchment paper and slightly flatten. thanks god another no bake recipe is here xD i’m so excited of this. thanks for sharing this, Dorothy.